The goal of this interdisciplinary project is to explore blue crab biology and ecology in support of sustainable fisheries management. The blue crab (Callinectes sapidus) is one of the Chesapeake Bay's most iconic species and is highly valued for its role in Maryland's culture and economy. Its fishery is regularly ranked as one of the top 10 most valuable commercial fisheries in the U.S. It’s one of the more complex fisheries with multiple management jurisdictions, recreational and commercial harvests, regional and season variation in fishing gear and effort, and a variety of markets. Just as complex is the blue crab’s life history that includes age-specific habitat use and migration, female spawning migration, and larval and juvenile migration between the Chesapeake Bay and the ocean. Because of the complex nature of biology, ecology and fisheries management of blue crabs, sustainable management has been challenging. Every blue crab that is caught with a pink or white tag is eligible for a $5 or $50 reward, and an extra reward if a white-tagged female is kept, frozen, and returned to us (note: in MD, female crabs are only allowed to be kept by commercial watermen). Visit our Blue Crab Reporting webpage for reporting instructions. 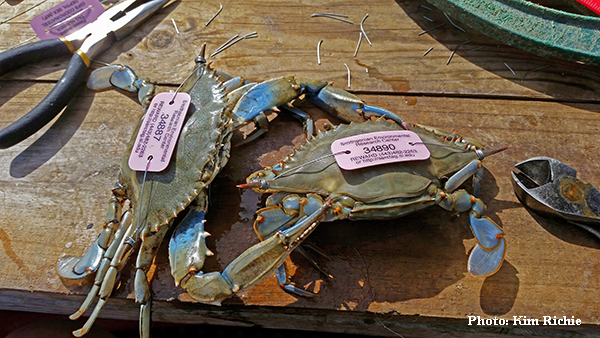 Blue Crabs with SERC pink tag. 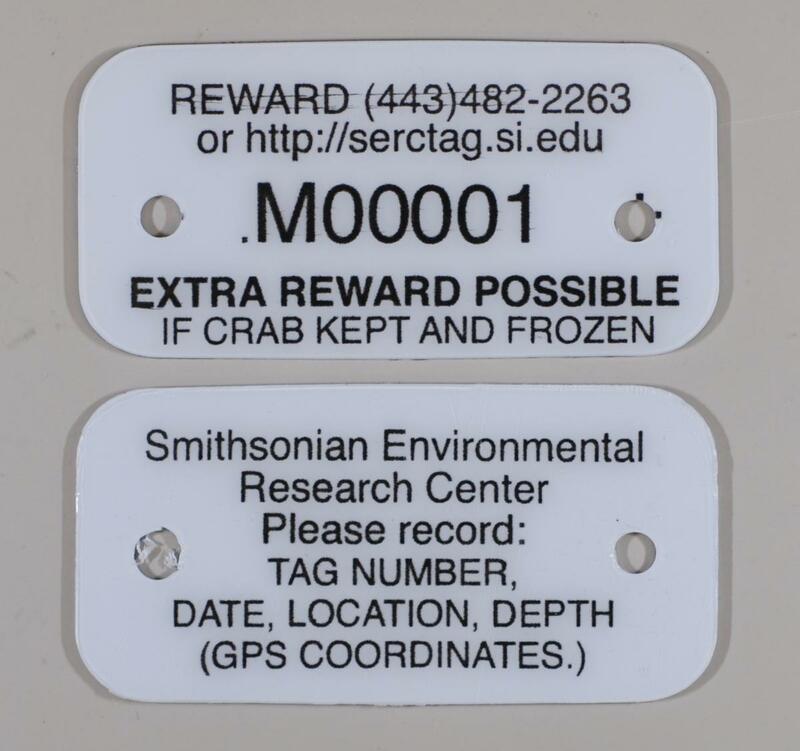 SERC crab white tag. Reward eligible if returned. Marine biologist Tuck Hines and a local Chesapeake crabber narrate the fall of the blue crab, and what may be the start of a recovery.